The rise of strong nationalist and religious movements in postcolonial and newly democratic countries alarms many Western observers. In The Saffron Wave, Thomas Hansen turns our attention to recent events in the worlds largest democracy, India. Here he analyzes Indian receptivity to the right-wing Hindu nationalist party and its political wing, the Bharatiya Janata Party (BJP), which claims to create a polity based on "ancient" Hindu culture. Rather than interpreting Hindu nationalism as a mainly religious phenomenon, or a strictly political movement, Hansen places the BJP within the context of the larger transformations of democratic governance in India.Hansen demonstrates that democratic transformation has enabled such developments as political mobilization among the lower castes and civil protections for religious minorities. Against this backdrop, the Hindu nationalist movement has successfully articulated the anxieties and desires of the large and amorphous Indian middle class. A form of conservative populism, the movement has attracted not only privileged groups fearing encroachment on their dominant positions but also "plebeian" and impoverished groups seeking recognition around a majoritarian rhetoric of cultural pride, order, and national strength. 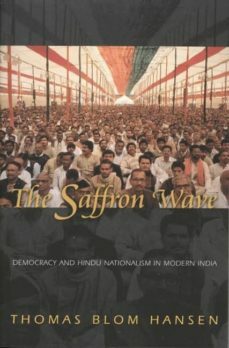 Combining political theory, ethnographic material, and sensitivity to colonial and postcolonial history, The Saffron Wave offers fresh insights into Indian politics and, by focusing on the links between democracy and ethnic majoritarianism, advances our understanding of democracy in the postcolonial world.